The Swingline SX16-08 cross cut shredder is an epitome of excellence, offering premium performance features. This paper shredder is ideal for 1-5 users. It can successfully shred up to 16 sheets, creating cross cut particles of 5/32" x 1 3/4" at 7 ft./min. It offers a security level P-3, finely shredding the documents. The 9” wide feed throat facilitates in inserting standard sized documents that, after being shredded, are collected in the spacious 8-gallon waste bin, for discarding. Swingline SX16-08 cross cut shredder effectively caters the needs of small offices and shreds paper, optical media, staples, credit cards, and paper clips. It is a Jam Free shredder; shreds without paper jams. In the case of too many papers are fed, it stops shredding and starts blinking. It features thermal overload protection. 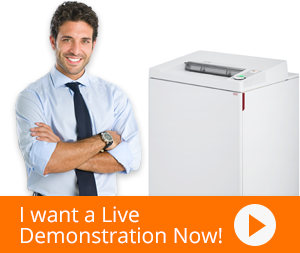 The Jam Free shredder saves operational costs by activating a sleep mode when not in use. Swingline SX16-08 shredder comes with a pull-out waste bin; using plastic or paper bags. When the bin gets full, it starts blinking. The automatic cleaning of the shredder’s cutting blades guarantees smooth shredding. Hi Adam here with the SX1608 crosscut shredder from swingline. Choose a personal or small business shredders it's more than just tough. The swingline SX1608 crosscut shredder features a large capacity for shredding a wide variety of items. The sheet capacity of the SX1608 is 16 sheets and the waste bin holds 8 gallons of shreds. The SX 1608 can also shred CDs and credit cards. Non-stop Jam free technology delivers hassle-free performance. The shredder stops and the indicator light glows red when too much papers inserted. Simply remove the excess sheets until the indicator light turns green to continue shredding. The swingline SX1608 is durable, reliable and designed to withstand heavy long term use. Their even eco-friendly by means of an energy saving power save mode with Auto wake up and paper bags for recycling. The SX16 08 comes with a lifetime warranty on the cutting blade and a 2-year warranty on the machine. These features and more make the SX1608 the right choice for your reliable security shredding needs.